Science Minus Details: Why Pee is Cool - entry #1 - "Why Is Pee Yellow?" 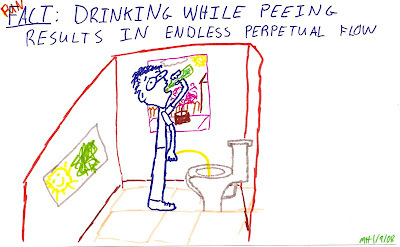 or "Rainbow of Urine"
Why Pee is Cool - entry #1 - "Why Is Pee Yellow?" 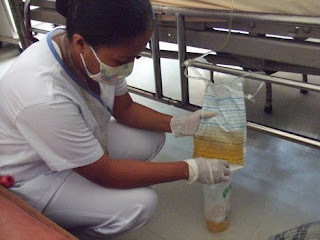 or "Rainbow of Urine"
PeePee! Jokes about it will never stop being funny, and facts about it will never stop being interesting! In this series of posts we will learn what pee is and discover how it connects us with the rest of life on earth and how humans have used it to learn more about the nature of the universe. Get ready for a wild ride! 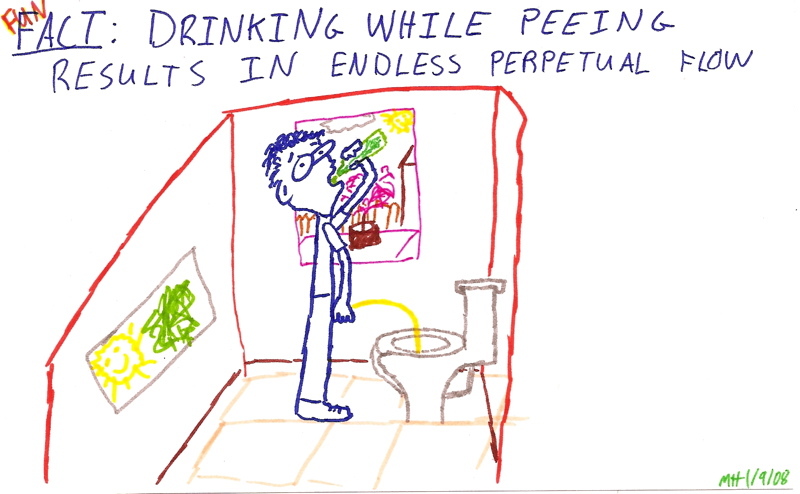 To begin with, what is pee anyway? Well, like most things associated with life, it is mostly water (>95% in fact). The other primary constituents of pee are various nitrogen-containing chemicals (mainly urea for us and other mammals) that are the result of your body breaking down protein. We will talk more about urea in future entries, but to start with let's talk pee color! The yellow color of your pee comes mostly from the breakdown of chemicals in your blood! Crazy right?!! Your body is constantly making new chemicals and breaking down old ones, and your blood chemicals are no exception. The chemical in your blood that makes it red is called heme. Heme is the molecule to which oxygen molecules bind to be distributed throughout your body. The red color of heme is primarily due to electrons in its iron atom but also to electrons in its cool ringed structure (the ringed structure is called a porphyrin, and is found in plants' chlorophyll as well as in the ground's crude oil!). Your body turns the heme molecule from red to yellow by ejecting the iron atom out of the center and breaking the ringed molecule open using oxygen. This is how your body gets rid of old heme molecules. The ring-opened product is known as urobilin, and is one of the primary reasons your pee is yellow. Your pee tends to be more yellow in the morning than in the evening simply because there is a higher concentration of urobilin in morning pee since you've been breaking down old blood molecules all night. Notice all the alternating single and double bonds (highlighted in blue) in both molecules and that metal (Fe = iron) in heme. Those are the two reasons they absorb visible light and are colored! 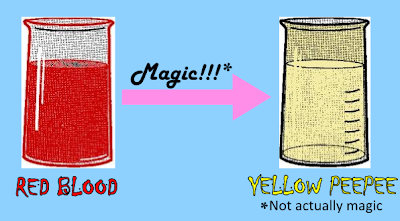 This is a common theme for all colored molecules anywhere! There are lots of jobs available in health care! Any peepee aficionados out there may know that yellow is not the only color that your peepee can beebee. 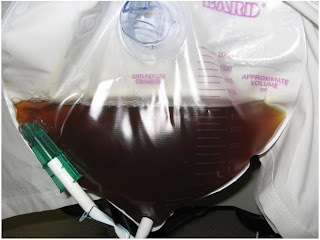 The pee of people who have a disorder called porphyria (derived from the greek porphyra, meaning "purple pigment") can be purple, brown, or even red! 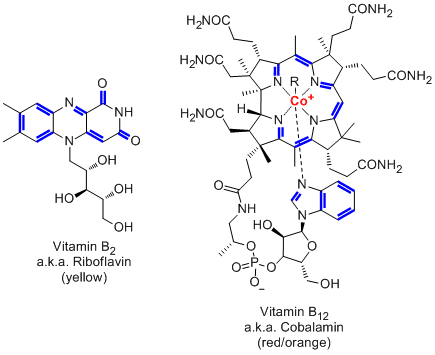 This is due to a malfunction in one of their enzymes responsible for manufacturing heme, which results in a log-jam of heme-molecule precursors that end up being urinated out. 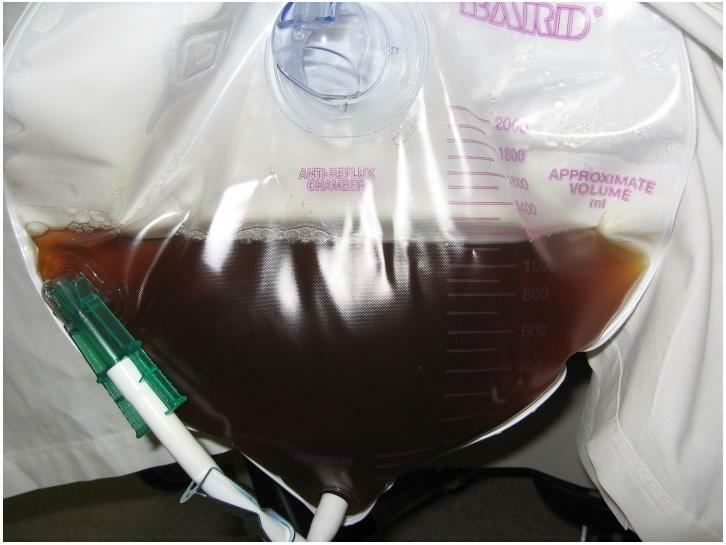 Brownish urine can be caused by the buildup of porphyrin precursors. This peepee image and those below were taken from lifeinthefastlane.com. Your pee can be intensely yellow- or orange-colored if you take excess B vitamins, specifically vitamins B2 and B12. Your body deals with this excess by just peeing them out. Notice how vitamin B12 looks similar to heme. Look at all those alternating single and double bonds and that metal atom (Co = cobalt)! Chemistry is easy and fun! 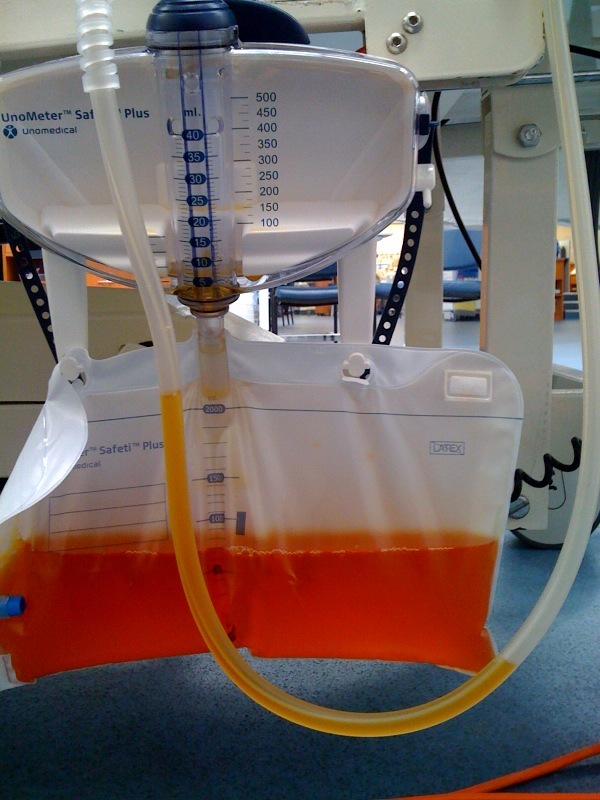 Orange- or even red-colored urine can be caused by certain pharmaceutical drugs (e.g. rifampicin and phenazopyridine) or by beets (which contain cool betalain pigments such as betanin and indicaxanthin)(ref, ref). Orange urine can be caused by excess B vitamins, a variety of medications, and bunches of other stuff. Perhaps best of all, the anti-malarial drug methylene blue (and lots of other drugs) can actually turn your urine green (blue drug + yellow pee = green crazy pee)! 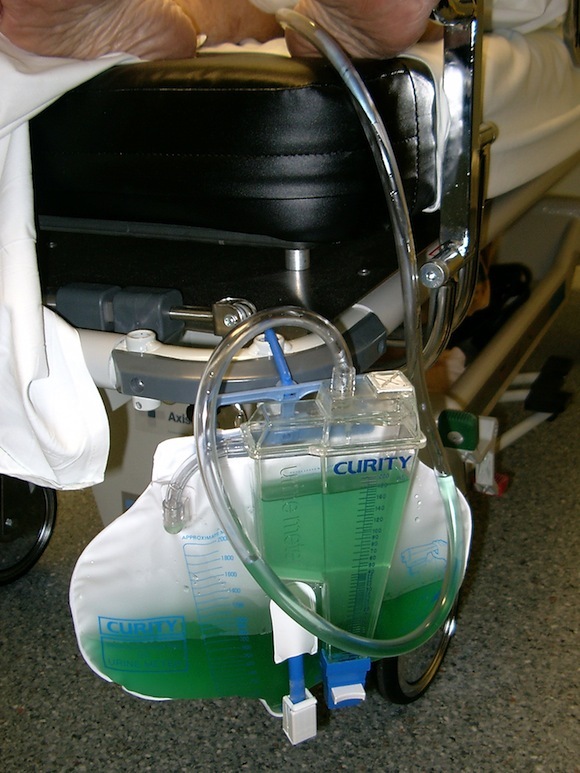 Green urine can be caused by a variety of medications, or even foods such as asparagus. I spoke too soon about the best pee of all. Purple (!!!) urine can result from bacteria smashing two light yellow molecules together to make the mega purple dye indigo (ref). Incidentally, indigo was one of the first dyes ever produced by humans, dating back to 7th century BC Mesopotamia. It was produced in a nearly identical process to the one that happens in purple-peeing-people. The bacterial transformation of indoxyl sulfate to indigo. Indigo changed the world, I'm not kidding, look it up. 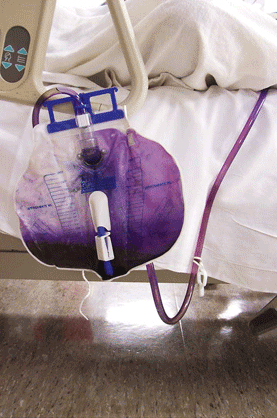 Purple pee can be caused by the production of a mega famous dye by bacteria in your urine. All these awesome colors are created by molecules that have either a single metal atom or alternating double and single bonds, which allows their electrons to move in such a way that they absorb visible light. It's that simple! When you pee the chemicals out they can make up less than 1% of your urine, yet they absorb so much light they can completely change the color of your pee!! Amazing! Awesome! What's up with minerals in pee? How/why do people get kidney stones? Are those things even related? I have so little peepee knowledge. This is an excellent question, and I might cover this topic in a more clear manner in future peepee posts, but we'll see. going back to the emergency situation where you MIGHT be able to drink your own pee if you remove the water...what about poo poo? could you boil your poo poo to make it safe and survive on it if you were like stranded on a desert online LOST style? TELL ME!!!! I am very sorry but I don't really have an answer for this. Anyone out there in internet land, please leave an answer here to help us!!! My guess is that it wouldn't help you much. Though I'm not 100% sure of its composition, my impression of poop is that it is stuff that your body was either not able to make use of, or has made us of and is discarding. That is pretty much the same for pee, except pee contains water-soluble waste, and a certain amount of water needs to be excreted along with this to make sure things don't precipitate out and clog the pipes (kidney stones, etc). And water IS useful, as long as you can purify it like u suggested. I just really don't think that's the case for poop. You'd probably be better setting up a pee distillation apparatus and going to hunt for some rats to eat. Hey Lee. It's asparagus season here in South-Western Germany, a big deal around here. Lots of people with stinky peepee I imagine. Perhaps an explanation of what in asparagus makes your peepee smell funny would be an interesting topic. Aubry!!! I love the idea of asparagus season being the same thing as stinky pee season! "Why Does Pee Smell?" will DEFINITELY be the next post! Well, speaking of pee smell, I presume you'll be talking about Maple Syrup Urine Disease which, as diseases go, sounds awfully tasty. In a similar vein, there's the herbal supplement fenugreek, used by breastfeeding mothers to up milk production, which can make urine and sweat smell like delicious, delicious maple syrup without all the disease. 4sure! Maple Syrup Urine Disease was on my radar, but I had not heard of fenugreek w.r.t. pee smell. Thanks! Huh, I just read about waterless urinals in the last issue of C&En News (apparently it is the reaction of urine (or one of the nitrogen containing compounds in it) with water which produces ammonia gas and the associated urine smell)... also... protoporphyria! SO interesting. I had to talk about this disease to a bunch of high schoolers that came to my school to learn about photochemistry! Some people think that this disease is at the base of the vampire legends (people with this disorder may have fluorescent glowing skin, receding bleeding gums, and usually don't come out much during the day to avoid the sun)! Cool series, looking forward to the rest! I'll have to check out that C&ENews article. It is definitely the reaction of water and urea that produces most of the smell of pee. You totally read my mind there, the next post is about pee smell and will be finished within the next day or so. That is amazing about porphyria and vampires! That would get high-schoolers pretty amped I'm sure. Awesome way to discuss photochemistry too! Thanks 4 the comment and kind words, stay tuned! Question- why does asparagus make my pee stink?